Who’s the guy who made the Cold War … cool? Why, the American James Bond, Nick Carter, of course! 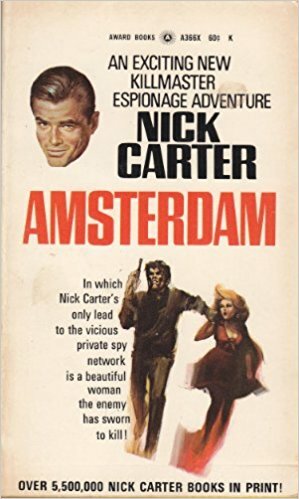 And it doesn’t get much cooler than Nick Carter, Killmaster: Amsterdam, a plot-light traipse through some of the more scenic parts of the Netherlands—and not a few excursions through some rather gratuitously described nether regions.Actually, it does get much cooler than Nick Carter, Killmaster: Amsterdam. What it doesn’t get is much more tepid or forgettable. But when a vacation isn’t going well, it’s time to make your own fun! So we do, ranging from Gorilla Biscuits to Gorilla Unit and trying to gin up some suspense of some kind in a book that drops foreshadowing hints like this: “Nick noted that she kept the big flat artist’s case with her, as she had on the plane, where she even carried it to the powder room. Its contents might prove interesting, or they might just be ad proofs and sketches of jewelry settings; it was not worth a move on his part—yet.” Riveting, riveting stuff. Please feel free to mention everything that isn’t worth a move on Nick Carter’s part yet. If you want to read more about Nick Carter, that’s seriously weird. But we can recommend the Glorious Trash blog on that front. So. If you’re ready for a trip, put on your red light, grab your wooden shoes and prepare to plant tulips right on … Nick Carter.